VR and AR: Will 2016 be their Big Year? Home » E-Learning » VR and AR: Will 2016 be their Big Year? For many years, virtual reality has been promising to transform both education and workplace training. To date, the promise of VR has not been realized largely due to practical considerations. First, until this year, the hardware required to experience VR has remained out of reach to the average consumer and even to most small workplaces. Second, virtual reality had a tendency to cause nausea and vertigo, which simply are not much fun. As we enter 2016, the hype about virtual reality (VR) and its somewhat more earthly cousin, augmented reality (AR) is again on the rise—this time with a growing range of affordable options. But will 2016 prove to be the year when VR and AR finally take off and begin to transform entertainment as well as education and workplace training? Virtual reality can refer to any use of computer technology that creates a simulated and more importantly, 3D world, which users can interact with in order to create the feeling that they are actually there. In order to experience VR, one requires some form of hardware (see the next section for details). While there is no consensus, VR is typically defined on two bases: 1.) It presents 3D images that appear to be life-sized from the viewer’s perspective, and 2.) It includes the ability to track a viewer’s motions, including head and eye movements, and correspondingly adjust the images on the display to reflect changes in perspective. Augmented reality can refer to any use of computer technology to create an additional layer of information or experience over top of a user’s lived experience. Rather than immersing one in a virtual world, augmented reality strives for integration—it aims to bring the digital and material worlds together. In order to experience AR, a user must download software applications or browser plug-in to their mobile device. While hardware is still required, AR can typically be experienced using the hardware we already have on hand (e.g. a smartphone or tablet). In late 2015, there are now a growing number of commercial products that promise to bring the VR and/or AR experience home and into our schools and workplaces. Four of the most hyped consumer options are listed below. The Oculus Rift, which retails at anywhere from $1200 to $1500, is a slick and relatively user-friendly VR device. The target audience is gamers with money to invest in high-end devices but the Rift will likely also find a home in some work environments as it evolves. Gear VR, also powered by Oculus, is a much more affordable Samsung VR device, primarily targeting gamers. While it has some limitations, it, in fact, shares most of the Rift’s capabilities and comes at a much lower price point—a mere $99. Indeed, given the price point, it seems likely that the Samsung Gear VR will be a popular Hanukkah and Christmas gift in late 2015. Microsoft’s HoloLens, scheduled to roll out in 2016, will come at a steep price point—about $3000 per unit. 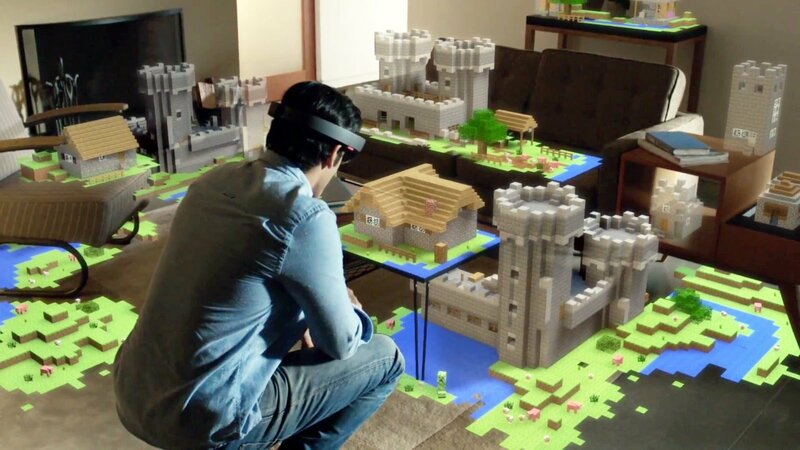 In contrast to the Rift and Gear VR, the HoloLens is being rolled out as an AR device as much as a VR device and targeting workplaces and educational institutions more than gamers. Essentially a holographic computer built into a headset, the HoloLens will enable viewers to see, hear and interact with holograms in any environment. This is clearly emphasized in the HoloLens trailer released this year, which shows individuals using the device to do everything from design motorcycles to fix a bathroom sink. 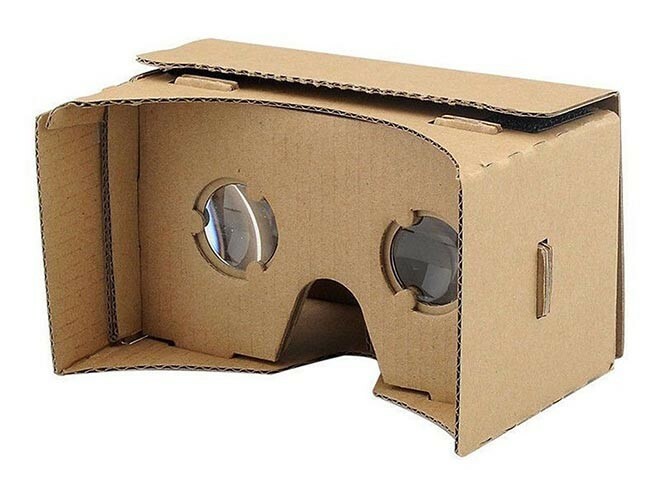 On the opposite end of the spectrum, is Google Cardboard. With a price point in everyone’s budget (you can buy a model for $20 online or make the device for free with any cardboard you have on hand following the instructions posted on the Google Cardboard site), the device promises to have widespread applications in schools and workplaces. While it is not the HoloLens, it does offer one the opportunity to experience VR and AR and is meant first and foremost to drive the development of future VR and AR applications by finally putting VR and AR hardware in the hands of a large number of users. VR has been used in some workplace training scenarios for years. For example, NASA has been using it for nearly two decades to prepare astronauts for spacewalks. Virtual reality is also being used to train first responders, emergency room doctors and other people in professions where simulations are a key part of training. To date, less high stakes industries have not embraced VR-based training due to the cost and due to the fact that training people in some workplaces is simply less risky. After all, managing the risks of putting a new retail worker on the floor versus managing the risks of putting a new surgeon into the operating room are two very different things. In the end, AR’s applications will likely prove far more useful in most workplaces. Among other application, AR might be used to display navigational information on the windshield of a taxicab or delivery truck or provide visual and audio guidance to help workers complete complex tasks. AR also naturally holds much potential to be used in the culture industry (e.g., for museum tours) and in retail (e.g., shoppers might be able to scan items to learn about their price and production history so they can make more ethical and informed choices). Of course, AR also holds the potential to support workers who are apprenticing in specific trades. For example, a worker could be on the job—fixing pipes or electrical circuits in a tight location that may only be large enough for a single worker—but still receive real-time guidance from their mentor while keeping their hands free to do the work. A major advantage of AR, albeit one not yet fully explored, is that with AR, the apprenticeship model used in many trades can be re-imagined to possibly include semi-retired workers. For example, with AR, an older worker, perhaps even one with an injury that makes it difficult or impossible for him or her to be on site, could apprentice new workers from a distance. With the right support, AR could be used to harness the knowledge of workers in the trades, even long after they are able to work on site. At the same time, older workers would potentially benefit as well on two levels. First, older workers in the trades may be able to keep working longer, since even an older worker with limited mobility may be able to work from home or an office providing valuable on the ground mentorship via AR technologies. Second, as reported in an earlier post on the eLeap Blog, researchers have discovered that older people who use digital technologies on a regular basis may also benefit on a cognitive level (e.g., research suggests that digital gaming supports improvements in processing speed, attention, and the immediate and delayed visual recognition memory of people ages 57 to 80). With affordable options, like Gear VR and Google Cardboard, it seems likely that in the coming year, VR will become increasingly common at home as a form of entertainment and AR will begin to make inroads in schools and workplaces. That VR and perhaps more notably, AR will become standard features of learning management systems over the coming three to five years now appears inevitable. What form VR and AR-based training will take will depend much on who embraces the technology. What is clear is that in contrast to earlier digital technologies, the work environments that may have the most to gain from AR are those environments that may appear to be the least digitally advanced (e.g., the construction industry). From worksite safety to apprenticeships, there is great potential to use AR to support workers across the industry. For more details regarding price comparison for VR headset stay tune with us.